ÁNGELES AGRELA Born in Úbeda, Jaén, 1966 A Fine Arts graduate from the Universidad Alonso Cano of Granada, Ángeles Agrela completed her training by spending time in Naples, Havana, and Berlin. 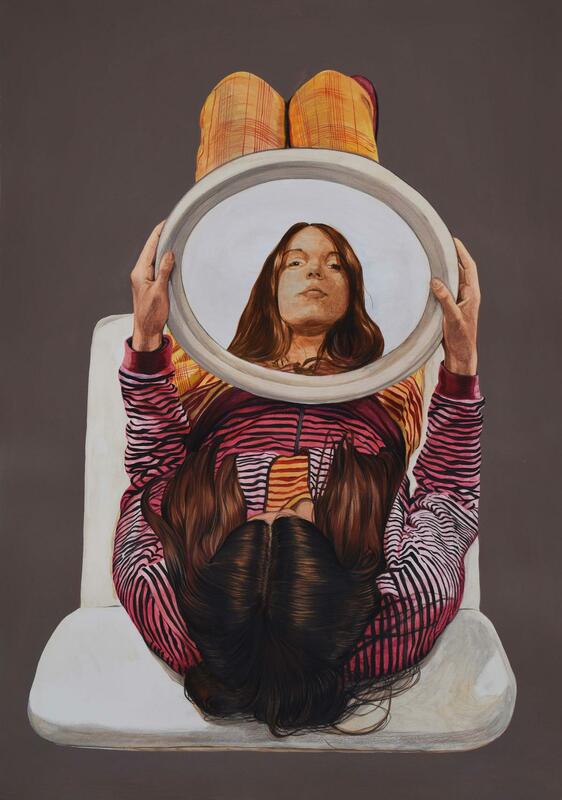 Since she began to exhibit in the 1990s she has been awarded the BMW Painting Prize in 2015, the Plastic Arts Prize of the Regional Government of Cantabria in 2010, and the Andalusia Art and Sports Prize in 2004 among other prizes and scholarships. The “Fanzine” and “El favor de las bellas” (The Favour of the Fair) series of drawings introduce a criticism of the roles of women throughout the History of Art. The references to pop, comics, or fashion magazines act as a framework for compositions featuring women on decorative backgrounds from various genres related to femininity such as still life, nature, the privacy of the home, craftsmanship, and embroidery. Irony enables the artist to question the stereotypes and the homogenisation of our behaviour.